Walpurgis Night in Sweden is a very special event and a great way to experience Sweden's traditions. Walpurgis (Swedish: "Valborg") on April 30 is a widely celebrated event in Scandinavia, most of all in Sweden. Walpurgis Night precedes Labour Day in Scandinavia on May 1 and many Walpurgis events continue overnight from April 30 into that holiday. The forms of celebration in Sweden vary in different parts of the country and between different cities. 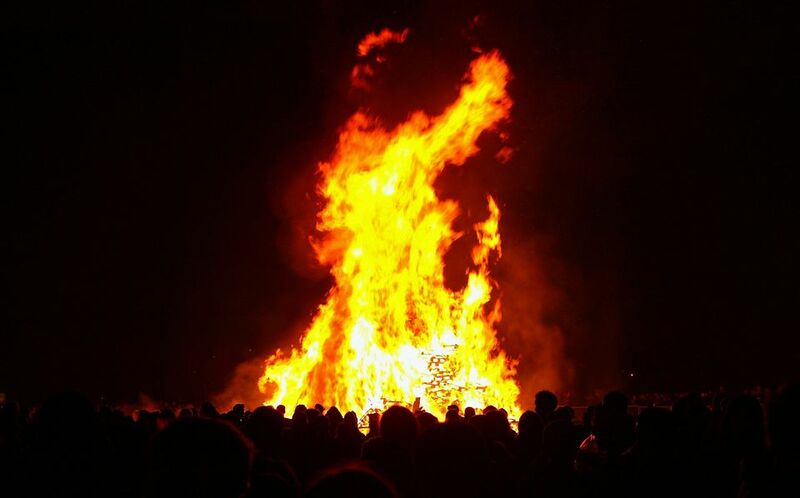 One of the main traditions in Sweden is to light large bonfires, a custom which began during the 18th century. Lighting the popular bonfires began with the purpose of keeping away evil spirits, especially demons and witches. As a final highlight, there are fireworks. Nowadays, Walpurgis Night is usually seen as a celebration of springtime. The Skansen Open Air Museum, for example, hosts Stockholm's largest historical Walpurgis celebration. Many Swedes now celebrate the end of long, dreary winters by singing Spring songs. These songs were spread by the students' spring festivities and Walpurgis Night celebrations are especially common in university towns like Uppsala - the nightlife in Uppsala is especially active then. Walpurgis (Valborg) being celebrated on April 30 creates a double national holiday in Sweden. On this day, King Carl XVI Gustaf celebrates his birthday. So you'll see Swedish flags all around the country to salute the King and show him respect. May Day/Labor Day (May 1st) follows Walpurgis Night celebrations with a wide choice of events, parades, and festivities. The joyful celebration around the fire is an old Germanic and Celtic tradition. In Sweden, the land of trolls, witches, and elves, Christianity was unable to eradicate this celebration. In late April, in Sweden, the days are getting longer again, temperatures rise, and farmers begin visiting their fields again. This celebration is an annual tradition. The namesake of the event is the abbess Walburga (also Walpurga or Walpurgis), who lived in the 8th century (710-779). She grew up in England and was from a good family, but orphaned as a child and lived in the monastery as a missionary. She was later sainted. If you are planning to attend such an event during your visit to Sweden, please make sure to pack clothing you can layer. The weather at this time of the year is still rather unpredictable and you may need warmer clothing than expected. Also, weatherproof shoes or boots will be helpful since this is always an outdoor event and may even take place in the middle of a field where it recently rained. Walpurgis in Swedish is "Valborg" and Walpurgis Night in Swedish is called "Valborgsmassoafton". Learn more useful Swedish phrases.